Reno City Hall is located at 1 East First Street, Reno, NV 89505; phone: 775-334-4636. Photo: Greystone Castle, ca. 1930, 970 Joaquin Miller Drive, Reno, Nevada. Built in 1930 by developer W.E. Barnard, the house was advertised as having "the charm of an old English castle and all the modern conveniences of the very latest American home." Listed on the National Register of Historic Places in 2002. Photographed by User:Jeffrey Beall (own work), 2011, [cc-by-3.0 (creativecommons.org/licenses/by/3.0)], via Wikimedia Commons, accessed April, 2013. Washoe and Paiute peoples inhabited the land along the Truckee River when the first white men passed through in the 1840s. In the late 1840s and 1850s, thousands of emigrants crossed the Sierra Nevada to the gold fields of California. The travelers would remain a few days in the Truckee Meadows to allow their animals to feed on the native grasses. The first permanent white settlement along the Truckee River was Jamison's Station. Jamison was among the Mormon contingent sent by Brigham Young in 1855, to establish agricultural settlements in the western part of Utah Territory. Later, Young recalled his followers to Salt Lake City, and non-Mormons, or gentiles, took over the places established by the Mormons. Agriculture in the Truckee Meadows flourished as emigrants established ranches and stations along the travel routes to harvest native grasses for their animals as they made their way to the California Gold Rush. The lush fields of the Truckee Meadows offered excellent conditions for cattle and sheep grazing and the development of certain crops, and with the discovery of gold and silver on the Comstock, the number of settlers to the area increased. Reno was established with the construction of the Central Pacific Railroad in 1868-1869. The 1872 construction of the Virginia and Truckee Railroad, connecting Reno to Carson City and the Comstock, brought greater traffic. At first the little town was clustered around the railroad tracks and the Truckee River, consisting mostly of wood-framed structures with little architectural style or ornamentation. Agriculture thrived in the surrounding areas, especially with ready access to the railroad and the strong demand from booming mining districts. The state university was moved to Reno from Elko in 1885, establishing Reno as the state's educational center. Reno remained a relatively quiet place until the divorce trade, which began as early as 1900, developed into a thriving industry. Except for a two-year period, when the residency requirement was increased to one year (with noticeably disastrous economic effects), the waiting period for a Nevada divorce was six months. In 1927, during a period of competition among several states for the migratory divorce trade, the Nevada legislature shortened the residency period to three months. This act boosted the industry and divorce-seekers flocked to Reno. At the same time, Reno was the political center of the state. Figures such as Senator Francis Newlands, Senator George Nixon, and George Wingfield built mansions near the downtown core, through which the Truckee River runs. As the population grew, Reno gained political power that would not be eclipsed for half a century. In 1931, Nevada was beginning to feel the effects of the Great Depression. Mining was in a slump, and a devastating drought had seriously damaged crops, and sheep and cattle herds. Seeking a means to ameliorate the growing poverty in the State, the Nevada legislature revised its divorce law once again. This time, it shortened the residency requirement to six weeks and made the grounds for divorce more lenient. This act served to open the divorce floodgates. Over the ten years between 1929 and 1939, Washoe County courts granted more than 30,000 divorces (Harnion 1998). The legalization of gambling, also in 1931, created an industry that would grow to surpass the divorce trade. Hotels, clubs, and bars quickly added casinos. Soon Reno's downtown pulsed with neon lights and excited gamblers. By the 1940s, Virginia Street had become the main thoroughfare, serving as the center of activity from its crossing of the Truckee River to Ninth Street. The railroad, passing through the center of town, disembarked tourists daily, and the completion of U.S. 40, which traveled along Fourth Street, brought a steady stream of motorists through town. ... Reno is not merely a pleasure city: it is after all, a residence city, with thousands of modest, well-cared-for cottages; a city to which families with small children may come to live in beautiful, inspiring surroundings, with assurance that the little ones will have every opportunity and good influence to become well-educated and self-reliant citizens. Reno probably has more church members in proportion to its population than any other city in the far west: a fact which, unfortunately, is not sufficiently sensational to be given headlines in newspapers. In addition to "well-cared for cottages," Reno had an exclusive neighborhood of mansions. The area, which became known as the Newlands Neighborhood, included California Avenue from Belmont Road (now Arlington Avenue) to Keystone and Court Street from Belmont to Elm Circle. 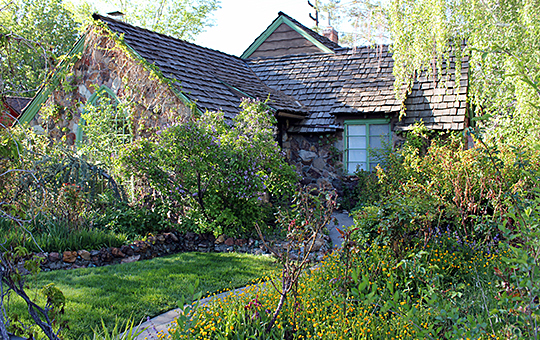 Many of the fashionable homes sat on the bluff overlooking the Truckee River. Senator Francis G. Newlands, who built his two-and-one-half-story Shingle-style home on Elm Court at the end of Court Street in 1890, set the tone of wealth and stature in the area. 1 Newlands was a San Francisco lawyer and son-in-law to Comstock silver baron William Sharon. He was the author of the Reclamation Act of 1902, which established a federal program to irrigate the arid West and open it for farming. Other prominent people built large homes in the neighborhood, including Senator George S. Nixon. George Nixon was one of Nevada's most powerful men, a wealthy banker who increased his wealth in the mining boom in Tonopah and Goldfield, and became a U.S. Senator in 1905. Nixon's mansion is an imposing 21,000-square-foot Spanish Colonial Revival built in 1906 on California Avenue. Another notable residence on Court Street is the home of Prince Hawkins, built in 1911 and designed by Elmer Grey, whose other projects include the Beverly Hills Hotel and the Huntington Library and Art Gallery. By the 1920s, Reno's population was expanding and with various regional mining booms and its reputation as a divorce colony, a number of wealthy people had settled here. When the Great Depression began in 1929, Reno was thriving. In an attempt to finance the growing need for social services, other states placed a particularly heavy tax burden on the wealthy. Nevada did other things to bolster its economy like legalize gambling and reduce the divorce residency requirement to six weeks. It also marketed itself as a haven for all who felt they were over-taxed. Mella Rothwell Harmon, State Historic Preservation Office, The Luella Garvey House, Reno, Washoe County, Nevada, nomination document, 2003, National Park Service, National Register of Historic Places, Washington, D.C.